The year 1957 saw the completion of the two works in tonight’s concert. Shostakovich had been speaking of a proposed Eleventh Symphony since at least April 1955 but had begun work on it only in late 1956. The composer finished the symphony by the end of 1957, despite having penned his Second Piano Concerto within that time. The concerto is the last, and most significant, of the pedagogical works Shostakovich wrote for his children. When his eldest offspring, Galina, began learning the piano Shostakovich would write short pieces for her to master one at a time. Six of these pieces (written between 1944 and 1945) were published as his `Children’s Notebook’, Op. 69, with a seventh piece, written for her ninth birthday in 1945, later added to the collection. Whereas Galina decided to make biology her profession – eventually enrolling at the Biology faculty of Moscow University – Maxim committed himself entirely to the study of music and the piano. While studying at the prestigious Moscow Central Music School (affiliated with, and a preparation for, the Moscow Conservatoire) the 16 year old Maxim was presented with the one movement `Concertino for Two Pianos’, Op. 94. He gave the first performance of the work on 8 November 1954 at the Music School with a classmate, Alla Maloletkova. In many ways the Piano Concerto No. 2 represents Maxim’s coming of age. The work bears a formal dedication (joining such prestigious names as Evgeny Mravinsky, Ivan Sollertinsky and David Oistrakh, soon to be joined by Mstislav Rostropovich and Galina Vishnevskaya) and it was on the strength of his performance of the work that Maxim gained entrance into the Moscow Conservatoire. Of the three pedagogical works this concerto is the most serious, immediately becoming a staple part of Shostakovich’s own concert repertoire. The first performance was given by Maxim, on his nineteenth birthday (10 May 1957), in the Great Hall of the Moscow Conservatoire, with the USSR State Symphony Orchestra under Nikolai Anosov. In a letter to the composer Edison Denisov Shostakovich complained that the work had no redeeming artistic merits, yet the critics of the day praised it for its `charming simplicity, carefree spirit and lyrical warmth’. 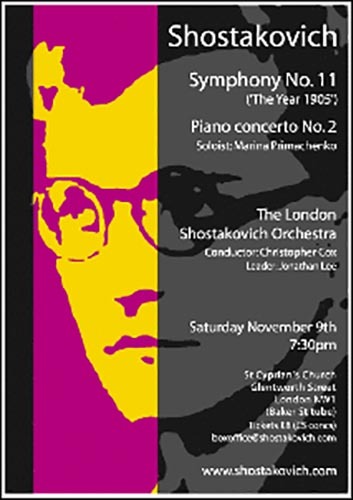 And David Rabinovich, one of the first biographers of Shostakovich, suggested that the concerto `shows the composer as though his own youth had returned to him’. The work itself strays little from the formal archetype of an 18th-Century concerto – in three movements with a sonata form opening Allegro, a slow middle movement and a brisk climactic finale. One particularly idiosyncratic feature of the work is the pervasive use of bare octaves in the piano part, as if the work were conceived largely for a single-voiced instrument. The first movement follows a concentrated and conventional sonata form structure and displays much of the octave piano writing that is a defining feature of the work. Perhaps the one bona fide cadenza of the entire concerto appears in this movement, just before the recapitulation, and is a development of the piano’s opening theme in the manner of a Bach two-part invention. The second movement is scored for piano and strings in the style of a Rachmaninov soliloquy. A movement of simplicity and clarity, this is perhaps one of Shostakovich’s purest, most lyrical and affecting utterances. The finale follows seamlessly with the aid of a motivic link and returns immediately to the spirit of youthful humour, mischief and piano octaves. In an atmosphere of increasing dissatisfaction with the autocratic rule of Russia by Tsar Nicholas II, 9 January 1905 witnessed a huge demonstration by workers and their families in the square outside the Winter Palace in St. Petersburg. An essentially peaceful protest turned into a massacre as Russian troops opened fire on the defenceless crowd, killing hundreds. In the event Shostakovich used a number of revolutionary songs, but rather than importing them as alien utterances, the themes are woven seamlessly into the fabric of the work. For contemporaneous Soviet critics this made for `a work of enormous realistic power’. In a discussion of the symphony at a Union of Composers meeting in Moscow one critic remarked: Thanks to its extensive use of the revolutionary song heritage, the language of this symphony proved to be simpler and more accessible than in previous major works of the composer while remaining, at the same time, deeply individual. Shostakovich’s Symphony No. 11 scored a huge success for the composer and, in many respects, redeemed him after his failure to pay appropriate homage to the 30th anniversary of the October Revolution 10 years earlier. Indeed, such a positive response had not been received by a major work of Shostakovich since the premiere of his Symphony No. 7 in 1942. The work was premiered in Moscow on 30 October 1957 (the 40th anniversary of the October Revolution) and received the Lenin Prize in 1958. The programmatic content of this symphony is most clearly manifested in the descriptive titles given to each movement. The first movement, `Palace Square’, pictures the snow-covered square outside the Winter Palace in the middle of winter. Employing two 19th-century political songs, `Listen!’ and `The Prisoner’, Shostakovich considered this movement more of an introduction, setting the scene for what follows. The second movement, `9 January’, a depiction of the `Bloody Sunday’ massacre by Russian troops, introduces two themes from the sixth movement of Shostakovich’s `Ten Choral Poems on Revolutionary Texts’ of 1951. The third movement, `In Memoriam’, is a lament for those who lost their lives in the massacre, employing the revolutionary funeral march `You Fell a Victim’ – the song that accompanied Lenin’s burial in 1924 – leading to the finale, `Tocsin’, in which the heroic march style predicts ultimate victory for the revolutionaries. Unlike his oratorio `Song of the Forests’ (Op. 81, 1949), Shostakovich did not approach the symphony as simply a propagandistic potboiler. The work is a vast symphonic canvas; each movement played without a break and unified through the use of shared motivic ideas. Although on one level the work recalls events specific to the 1905 revolution, it has been noted by many commentators that it also carries more global significance, evoking not only this revolution but all revolutions. As Boris Schwarz wrote, Shostakovich’s 11th Symphony `is more reflection on a theme than a description of a theme’.